“The American media can only handle one African conflict per decade.” Those are the words of Omekongo Dibinga, speaking on a panel after a screening of When Elephants Fight, a new documentary from director Mike Ramsdell, narrated by Robin Wright, about the two-decade-old war in the Democratic Republic of Congo. Dibinga, a Congolese-American activist and academic, was there to help promote the film and raise awareness about the conflict in general, and his characterization of the US press is only slightly hyperbolic. With some notable exceptions, US media have largely overlooked a conflict that has left 5 million dead, in what many analysts say is the deadliest war since World War II. Elephants is an attempt to educate Western audiences—primarily Americans—about the role their governments and consumer habits play in perpetuating the violence in the Democratic Republic of Congo. At the heart of the story, as Elephants lays it out, is a familiar tale of a phenomenon known as the resource curse: A land-rich country, rather than prospering from its own abundance, suffers from outside exploitation, internal corruption, and deprivation for its citizens. In the case of the DRC, minerals, used to power iPhones and other technology, are the prized resource. In a fairer world, the DRC would be one of the richest countries in the world. In 2011, the United Nations estimated the DRC’s “untapped mineral reserves…to be worth $24 trillion.” Copper, coltan, tin, tantalum, tungsten, and gold are all abundant there, and US tech and mining companies have taken advantage of the war to get access to the minerals for next to nothing. There have been efforts to rein in the use of “conflict minerals” in tech production, primarily through the 2010 Dodd-Frank legislation. A lawsuit successfully kneecapped one of the bill’s key provisions, though, which would have required companies to label the minerals they used if they came from conflict areas in the DRC. But not everybody buys into that central conceit of Elephants, or of the Dodd-Frank provisions. 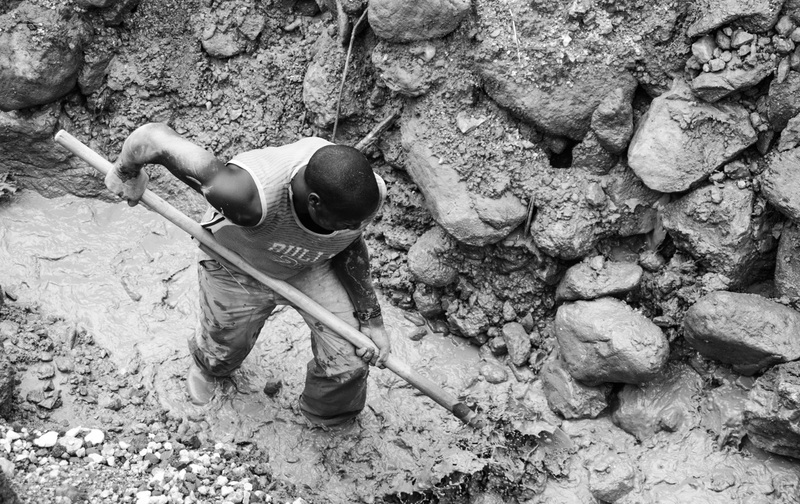 In Foreign Policy, Lauren Wolfe argues that the ban on using “conflict minerals” is having the unintended consequence of harming Congolese miners and driving their already small profit margin even lower. And, to its detriment, the film doesn’t adequately grapple with this counter-narrative. Visually, the Elephants is at its most gripping when showing GoPro footage of workers crawling deep into mines that become increasingly claustrophobic. In one scene, a miner falls over in the cramped space and then begins chuckling, an unsettling reminder that even the most dangerous work can become routine. In another fantastic segment, a middleman wears a hidden camera to show how he smuggles minerals from the Congo across the border to Rwanda. Distributors then tag the minerals as having originated in Rwanda. It’s a sign of how the chaos and lack of regulation in the region make it difficult to track what minerals are coming from where, and whether the profits are funding violent groups. The film only occasionally displays too-familiar images of poor African children set to swelling music, but even their scant presence undermines the film’s otherwise refreshing complexity. Ramsdell, to his credit, still communicates his awareness of the exploitative role he could play as a US filmmaker. Two of the most memorable moments, for instance, depict virtually the same encounter but with different Congolese. “You come here and take our pictures, but we never see the benefit of the work,” one man says, clearly exasperated. “What do we get out of the footage?” asks another. These are good questions to ask, and both the film and an associated activist campaign called #StandWithCongo (complete with smartphone app) attempt to offer some answers. The primary goal of the campaign is to put consumer pressure on companies to pledge to use minerals that are as conflict-free as possible, and the movement has already had some success. In 2014, Apple pledged to stop using minerals that had been sourced from conflict areas in the DRC. Elephants does a good job of explaining the colonial and postcolonial history of the DRC, including the death of Patrice Lumumba, the Congolese independence leader whose killing was backed by the CIA and then-President Dwight Eisenhower. The film also discusses the US support of the Rwandan government following the genocide in that country, and how Washington has largely given Rwanda a blank check to intervene in the Congo. When Elephants Fight does not shy away from naming individuals and companies that profit from the conflict—particularly Dan Gertler, an Israeli billionaire who has made millions in Congolese mining ventures. Gertler is a close friend of Joseph Kabila, the president of the DRC, and the film details how Gertler and others have used offshore tax havens to hide their profits and mask who exactly owns what mine. In a stunning bit of timing, Gertler is mentioned over 200 times in the leaked Panama Papers, a trove of documents that show how Panamanian law firm Mossack Fonseca helped financial elites hide their money in offshore tax havens. The film argues that the current wave of privatization is effectively selling off the DRC’s future for the short-term profit of a small group of government and corporate elites. There was a time, though, when the people of the Congo actually saw some of their country’s wealth. In the late 1960s, the US-supported dictator Mobutu Sese Seko nationalized the mines, which for a time became a great source of pride for many Congolese. The state-run company Gecamines was a symbol of the wealth the state could distribute among its people under the right circumstances, and for a time became a source of pride for the DRC (which was then called Zaire). Mobutu, however, let the infrastructure fall into disrepair and, although the government still owns the company, President Kabila has been selling it off under a shroud of secrecy. The depictions of Congolese humanity and pain in When Elephants Fight make it necessary viewing for Westerners, not least of all because of the role our consumption habits play in perpetuating the violence in the DRC. Dibinga, the Congolese-American activist and academic, was right when he said Americans are often indifferent to African suffering. Elephants forces audiences to confront that indifference, which is a needed—if insufficient—step towards ending the bloodiest conflict since WWII.